Born Free USA is a national animal advocacy nonprofit organization whose mission is to end the suffering of wild animals in captivity, rescue individual animals in need, protect wildlife, and encourage compassionate conservation globally. They have released these shocking statistics about fur used in fashion. If people didn’t see the cruelty in the fur trade before, they’ll see it now. 1. More than 50 million animals are violently killed for fashion every year. 2. Methods used to kill animals for their fur include gassing, electrocution, and neck breaking. 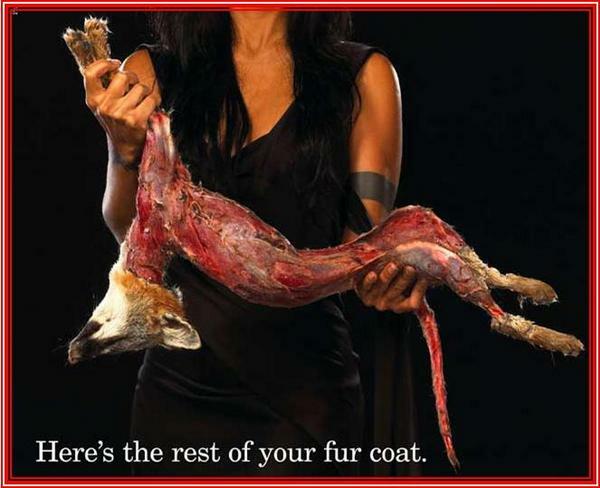 Most of the animals are skinned alive because it makes the fur more fresh. They are then throw to the side, left to die slowly in a heap of rotting, half- alive carcasses. 3. Neither fur nor fur trim is a byproduct of the meat industry, meaning that fur isn’t what is “left-over” from an animal that was skilled for its meat. Fur comes from animals who are factory-farmed or trapped purely for fashion. 4. The fur trim market is an equal, if not greater, threat to animals than is the making of fur coats. Again, fur trim is not what’s “left over” from making full-length fur coats. Thousands of animals are killed simply to provide trimming effects for fashion. 5. Currently, there are no federal laws providing protection for the millions of animals held in these factory-like farms. In fact, New York is the only state in which electrocuting animals anally and genitally is illegal. 6. Eighty-five percent of the fur industry’s skins come from animals who were captive on fur factory farms. 7. There are no penalties for people who abuse animals on fur farms in China, which is the world’s largest fur exporter supplying more than half of the finished garments in the United States. 8. Animals on fur farms are prevented from acting on their most basic instinctual behaviors, which causes them tremendous suffering. Even animals who have been caged since birth feel the need to move around, groom themselves, stretch their limbs, and exercise. All confined animals suffer from intense boredom—some so severely that they begin displaying neurotic behaviors such as pacing, turning in endless circles, self-mutilation, and even cannibalism. This post really opened my eyes to what is happening around me. Not that I purchase fur, but the fact that something like this hasn’t been outlawed in the US is crazy! The videos really struck a chord for me that I don’t think I will ever forget. The fact that people are skinning the animals alive after they have been deprived a normal life is disgusting. Good for you for shedding light onto something people try to not talk about!